I haven't been able to find much about Marsèll, but I have seen some pieces that I might want to buy. Does anyone have any information about Marsèll? How is the quality? Do the shoes fit true to size? 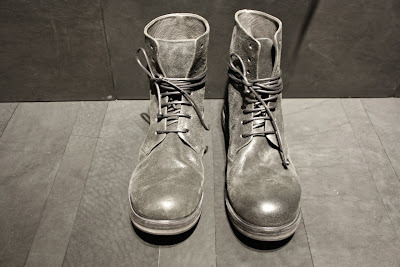 They use vegetable tanned leather, from what I've seen quality is awesome for construction and how they are finished. I own two pair and they are better with use. About the size I'am 42 and I buy 41. I have two pairs - a zip-up boot and a comfortable summer sandal. Both are really nice quality leather, good finishing, sturdy welts etc. Made in Italy and not some assembly-line, cardboard sole crap. Had a single stitch come undone inside by the zipper of the boot after a year of hard wear, so not much to complain about. The boots fit TTS, but the sandals run a bit large. I wouldn't second guess the decision to get a pair from them. My experience with marsell is that the quality is decent, sole is fine, leather can be too soft and pliable, I personally can't stand the little circle logo and there are some funky designs that don't really make much sense on a functional level (overlong laces on derbies that are supposed to go under the sole, etc.). My main gripe with them is that the shoes are always so weirdly sized, never true to size. 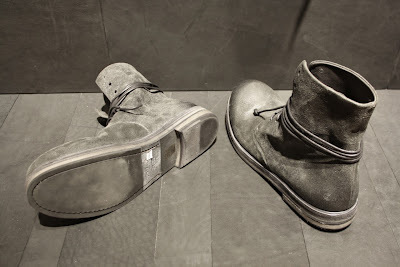 Like Guidi, sometimes they can be 2 sizes off. I heard they're about consistently 1.5 sizes large? 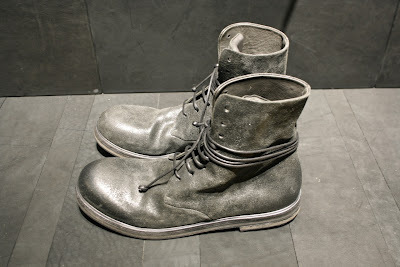 Do they still use Guidi leather or have they started using other tanneries? I own 2 pair of laced boots and these runs a little bit large (1/2 size up), but I am a 45 and I've bought a 45. Their customer service is stunning and shoes have a lifetime guaranteee. Huh, they're only a half size big? I thought most people said they were a size or even a size-and-a-half too big. Gah, all this different info... did Marsell change lasts recently or something? Last edited by jap808; 01-16-2015 at 10:59 AM. Does anyone know anything about the designers? I can't find anything other than the brand name is a combination of the names of the two designers? It seems like they know what they're doing, and use quality materials. I don't think you are going to find much, Defender. It's just a nice footwear brand that makes decent product. Sometimes that's all it is, and no mythology is needed. Tradition, innovation and experimentation mixed into design objects characterized by modern classicism with an artisanal touch; making style, always, an expression of the spirit of times: this is the mission of Eurasia Srl. The company was created at the end of the 90s. The founders were Roberto, Marco and Elisa Cima, and Andrea Rossi; the original headquarters were in Saonara. The will to give life to an industrial/artisanal enterprise with its very own distinguished identity soon led to the transformation of the firm into Eurasia Srl. Contextually with the moving to a new headquarters in Stra, in the scene of traditional footwear production in Riviera del Brenta, the brand Marsèll and EL (Elisanero) have been registered. In 2005 Mirko Rizzi joined the founding members. The project's expansion briefly led to the quest for new spaces, where to develop a research laboratory. Those have been founded in 2007 when Eurasia Srl moved to its current headquarters in Fiesso D'Artico. The company members share approach and vision: they are all autodidact, with intensely personal views. By rewriting the traditional approach to creation/production/distribution, they gave life to a singular system; a stubborn exploration of original design solutions, innovative distribution strategies and a stress on communication ensure a steady growth. Eurasia Srl produces shoes, bags and accessories with the Marsèll, Marsèll Goccia, EL and Settima labels. Collections are distributed worldwide by direct showrooms in Milan, Paris, New York and Tokyo. Each collection has its own identity; the guiding philosophy, however, is one, and can be summed in the mix of tradition, innovation, excellence and flexibility. These characters result from an approach to fashion-making where designers and artisans constantly challenge their own knowledge and savoir-faire; the aim is to dialogue with tradition only to surpass it while respecting it. The challenge is won through painstaking attention to detail, scrupulous selection of materials and direct control of production, which is entirely carried in-house or through small and trusted laboratories in the surrounding geographical area. Each phase keeps an artisanal imprint: finishes and key steps are made by hand; endless quality checks translate into exclusive objects that are unmistakable for both design, choice of materials and tactile intensity. These are from the website linked above by Jap808. Yeah, it sounds like a pretty tight organization focused on tradition and quality. I have 1 boot, 1 lace up, 1 sandal. I am usually a 42 and I have a 41 in both the boot and the lace up. I have a 42 in the sandal. I tried on the 41 sandal, and decided on the 42. The quality of the shoe is great. Take 1 size down. Just got the Stracasso 1450 slip-ons. I normally wear EU43, went for 42 and the fit is perfect.